For Sale tab if you want to know what's available and the price. If you are looking for a unique gift for a friend or want a new item for yourself, please feel free to contact me. I enjoy getting "special requests" and would love to hear from you. My life was turned upside down with the passing of my best friend and husband (George) in the fall of 2016. He was my biggest fan and gave me lots of encouragement and support. It's taken me quite a while to move past the grief and allow myself to feel creative. But it's time.. and I'm shaking off the cob webs (both mentally and physically) and doing what I love doing (and what I need to do) - Create Something New. It's my prayer that YOU are blessed with tremendous love in your hearts and lots of smiles to share with others throughout this year. 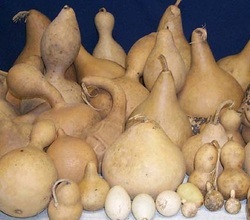 Gourds come in many different varieties, shapes, and sizes. This is what I love the most about my art canvas of choice.